The bridge between smartphones and digital cameras have already been established, by devices likes of Nokia’s line of high-end Lumia smartphones (think Lumia 1020) and the stuff from Samsung’s Galaxy Camera line. Nowadays, high-end DSLR and mirrorless cameras are beginning to incorporate Wi-Fi and NFC connectivity to provide us with a new arsenal of features that interact nicely with our smartphones. One of them we’ve recently got to check out, the Samsung NX30, features a very handy remote viewfinder option that works in conjunction with the accompanying apps for Android and iOS. So, how does this app from Samsung stack up when it comes to the shooting experience? Read on to find out. Before doing anything, the first task on hand is to download the free Samsung Smart Camera App, which surprisingly enough is not only available to Android devices, but there’s also an iOS app as well. A shocking revelation to say the least, since the app isn’t necessarily tied strictly to Samsung’s line of smartphones. Once that’s done with, we merely select the “Wi-Fi” option on the mode dial of the Samsung NX30, and then tap the back of our NFC-enabled Android smartphone to the NFC area of the NX30. With the iPhone, though, the process requires us to connect to the Wi-Fi network set up by the camera – and then launch the app. Both apps are laid out identically and function in the same manner, where we’re able to see what the camera lens is seeing, but on our smartphone of course. Indeed, there’s a subtle delay with its streaming to both our Apple iPhone 5s and Samsung Galaxy S5, but we don’t find it laggy or sluggish enough to diminish the overall experience. Seriously, the app is pretty useful in certain scenarios – such as when you’re trying to snap a photo that includes yourself being in the frame. Using the app, we can visually see how the shot is looking in real-time, so we can make adjustments to get the perfect photo. Better yet, we can choose from the usual shooting modes that are available with the Samsung NX30 – they consist of Auto, Aperture priority, Shutter priority, Program, and Manual. Both apps have manual control. In addition, we have access to other options as well to give us that control of the settings. For example, we can select the resolution of still images & videos, adjust the aperture/ISO/White Balance/shutter speed, and even setting up a timer. To the average Joe, Automatic mode will prove to be more than handy, but serious photographers will appreciate the app’s selective controls. Snapping a shot is simple too! 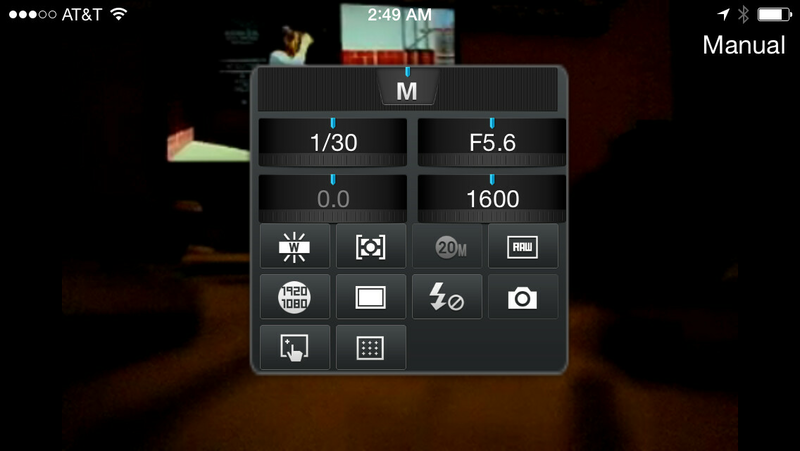 All that’s required is to tap an area in the shot, just like touch focus, and from there, the camera adjusts the focus. After everything is correctly set up, the last thing to do is press on the shutter key! Despite all of the improvements we’ve seen with camera phones, the quality from cameras like the Samsung NX30 continue to be superior. Certainly, the convenience factor is there with our smartphones when it comes to snapping something on the fly that you wish to share via social networking. However, we really appreciate how more and more DSLRs and mirrorless cameras are interacting with smartphones – for a higher level of functionality. No doubt, we’re seeing just that here with the Samsung Smart Camera App! No longer must someone be taken away from a group shot, seeing that a smartphone can now be used to remotely access the camera. Great addition by Samsung! I always liked DSLR-like Manual shooting on a phone! (FV-5 (or something like that?) comes to mind). It's always nice to see Samsung do something about it. I own the Samsung NX1000 and I absolutely love it. But I don't like how Samsung limited the remote shutter functions to apps on phones. Do they have any other wireless option that does not include a phone to use as a remote shutter? And is the NX30 limited in the same manner? Do you have to have the application on a phone or iPod(which I use in my case) to use as a wireless remote shutter? As far as I know the NX series only have wireless remote shutter release through an Android or iOS phone. You can however get a wired shutter release for the NX series cameras. Well I was hoping for another option that was wireless but at least I can use it fine on my iPod. Thanks for clearing that up. Nokia camera... simply the best camera APP ..
Read the article before trolling and fanboying mate. This is remote viewfinder, not camera app same way as Nokia camera. Nokia Camera is basically an app that takes pictures. Samsung Smart Camera app is basically an app that takes pictures. Basically no difference. Of course it looks like iOS. It's on an iPhone. Smart camera.....let me guess hm ? Oh, yeah it reminds me the Nokia Smart Cam app aka Nokia Camera that it's far better than this. Nokia used to have great camera phone before wp os. 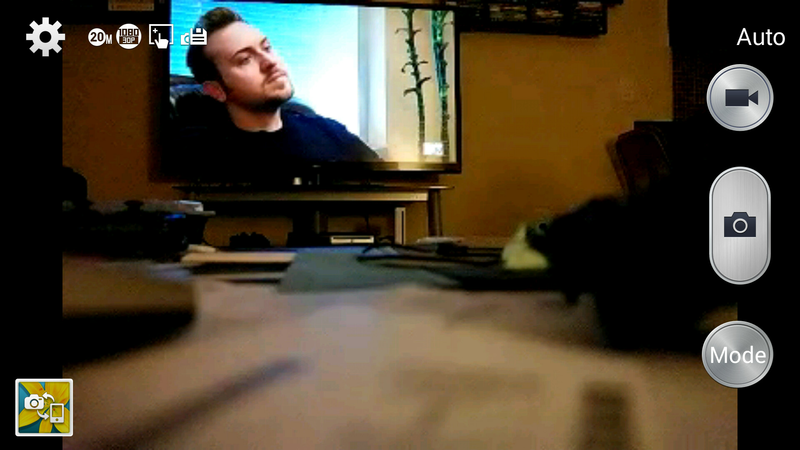 Now their flagship camera lag for a few seconds. By the time the app is ready show over! My note 2 and 3 fire its camera app instantly from the lock screen. Typical nokia fanboy, read the article, it is not a camera app, it is a remote access for samsung smart cameras. SMH.